When edging, for instance, trimming off bits of turf where lawn meets bed. And like mad during garden cleanup—which in windy, wet years like this seems to have been a pretty much nonstop affair. I’ve worn out a number of tip bags in my time, but generally speaking they’re pretty resilient creatures. I like the size-XL wide-mouth types, but you can get them smaller, more upright (like a giant beer can), or square, or even one that you wear. No kidding. Good if you are up on a ladder, for instance. I even turned some fabric nursery “pots” with handles into smaller tip bags, when I wasn’t happy with them for growing things. Most tip bags come with stiffening rings that you insert into the top lip, so the bag stays open. But as you can see from my photo, my tip bag’s usually at half mast, because I skip that feature. Just a quirk. Floppy is fine with me. I’ll admit I still feel sentimental about the bushel baskets—a.k.a., fruit baskets—that I used to be able to score at curbside outside the green grocer on trash nights. I loved getting them for free. (You can buy them by the dozen—but I don’t need a dozen; thankfully my local garden center now sells them one at a time, and now Amazon even sells onesies.) They didn’t visually “shout” in the garden as much as today’s unnatural-colored tip bags, but they didn’t hold as much, either. More trips to the heap, or at least to the wheelbarrow, required. For bigger jobs, I use a wheelbarrow or cart (like one of these) and for the biggest jobs, I just drag around a tarp–which might actually be the most Linus-like behavior of all. I’m not a lover of fancy garden gadgets, so the humble tip bag: on most days, it’s just my speed. 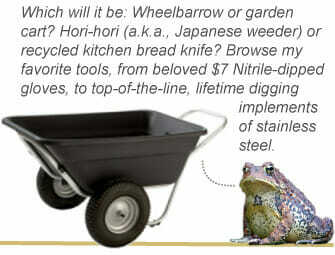 What’s your garden-cleanup partner? Bag, bin, basket, barrow, cart, tarp? I would love to try a set if these jars. They look amazing! I had the exact same tip bag you show in your photo and it disintegrated (especially the bottom) after one season! For weeding and pruning, I bring my biggest wheelbarrow and then have a big 10-gallon plastic bucket. I take the bucket into the bed with me to work, and periodically empty it into the wheelbarrow. When I have a few things to plant or divide, I bring my little red wagon (scored at a yard sale for $3), the kind with wooden sides that lift off. I load it up with pots and pull it around behind me like a kid. Just got home a couple hours ago from a day of Open Gardens, including yours. It was wonderful to see your garden in August, with all the shrubs loaded with berries and the beautiful foliage of various perennials all the more noticeable this time of year. Your garden looked great! And I loved the Broken Arrow plant sale. 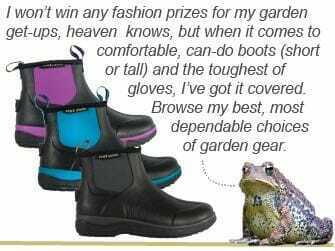 I have worn out two of these, though smaller ones as I’m a city gardener. They also work great for storing the hoses in the winter, keeps them well coiled and handles to get them into the basement. Now am loving the rubber thugs as weeding gets sorted into chickens will/won’t eat piles. The tip bag looks great although I don’t have any. Depending on how much I’m hauling I use tub trugs, 2 different size “beer type bags” and when I’m doing serious leaf raking a tarp-that always involves help from my husband! Hi Margaret! 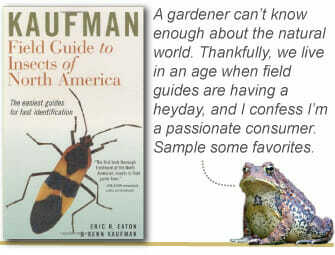 Thanks, as always, for your helpful guidance in tackling garden chores. For heavier items (or many things that then become heavy…), I get a lot of use out of my “yard cart.” It’s especially helpful when I have to lug a lot of debris out to the yard waste bin in the alley, or spread out a 2-3 cubic feet bag of anything around the yard. I have one, too, Kate — great for more serious tasks! Nice to see you. I had a pair of these tip bags for years and after lawnwaste pick up one week, they disappeared. I absolutely love these tip bags but have not seen them in any store since, can you tell me where they are available for purchase please? Thanks so much! Hi, Kelly. The brand named Bosmere seems to have taken over the market at least in the US, so those are the only ones I can find since my originals wore out. You can do a Google search for Bosmere tip bag and you will even find various sizes on Amazon. I now use my IKEA big blue shopping bags as tip bags. They don’t seem much different to me and cost a few cents at IKEA when checking out. I also now use a bucket to hold my tools when my carrier broke and I like it better. I can see everything inside. I have a folding softside wagon and will load it up with shovels, rakes, tools and whatever when I’m doing a big project to take it all into the back yard. The best garden shoe I’ve found is sloggers and they are colorful too. Me too! IKEA bags are my go to. Not pretty but cheap and plentiful. Hi Margaret. I use a gray metal container with a big handle sort of like a bucket except shorter and wider about 8″ deep and 2 feet across. I weed in one bed at a time usually and its a good size for that. The beauty of my weeding chores is that after I have a full bucket I take it to my chicken pen and my hens devour the stuff! (They are not free range). I am careful not to give them weeds with prickers though. My chickens are my compost pile!! I used Ikea bags for years. Cheap, durable for the price. My favorite flexible handled plastic trug which has lasted over five years has a broken handle and now I must replace it. Darn! Whatever my choice, it will be under $10. I bought my tip bag from Gardener’s Supply many years ago, and it looks like I’ve dragged it through the wars. But it soldiers on and so do I! Love it and use it almost daily during gardening season. My brother did a sheetrock Dr.bI have an abundance of those big spackle buckets! I then dump them into the paper collection bag. Not only do I love the tip-bag, but I also have a pair of yellow “giant hands” that I use to scoop up debris, leaves, etc. Don’t know what brand nor where I got them, but I hope they never wear out or break because I would be lost without them. Anyone who knows who makes these, I would appreciate it as I would like to purchase a spare pair. Sandi, I got mine at my local Ace Hardware. Ha — I’m a big fan of recycling and repurposing. I work part-time for a container gardening company. We reuse big potting-mix bags (heavy plastic). We fill them up — 4-8 each day — and then I bring them home to my compost bins. Anything weedy or undesirable goes into the client’s green bin. Win win — I get more compost, and the client’s green bin doesn’t fill up. They’re small enough to be portable, easy to carry from backyards or up/down hills, and stay contained in my car. But they’re big enough to hold a good amount, so we’re not constantly looking for new bags. At home, I use big nursery pots or buckets, depending on the job. Weeding oxalis, where there may be tiny bulbils, requires a bucket — and it goes in the trash or green bin. Veg garden cleanup uses a big nursery pot, 5 or 10 gal., and for sweeping up leaves or twigs, or storing “browns” for the compost, I use the biggest pots. Are you aware that the EVENTBRITE site tells us to “choose another time slot for the June 3rd garden tour? And when I did, it said again to “choose another time slot?” So, I went ahead through the purchasing and ticketing and it worked for me! I surely hope the event was not sold out and that my tickets are valid! I like to drag around the recycle brown paper bags for my yard waste. I often use big but short plant pots. Or muck buckets, or tarps. I’ve seen the big bags they have at Home Depot in the construction area. You buy the bag and then fill it with your remodeling debris then they come get it like it’s a dumpster. I believe if you buy that huge bag from them, it is yours and only if you have them retrieve it will you be charged for the dumping service. That may be way too big for some, but I may need that this year. I bought a very old house with a lot of garden going on. This year I’ll let it go to see what I have and next year plan accordingly. I have used tip bags for years- however I have not seen them for sale for quite a while, where do you buy yours? Gardeners.com has a medium and a large tip bag, $24.95 and $29.95. I just checked. I’m glad because mine is starting to wear out! For tip bags, nothing beats the 59 cent Ikea bags. They hold a lot, they are cheap and when they get a tear, I throw them out. But I have a number that have lasted 4-5 years so far. Can’t beat the price. I’m in tip bag mode also, as garden clean-up is underway in western Wisconsin. Not that anything is growing or leafing out yet…I did purchase a garden cart like the one you use, Margaret, and it is superb! Holds many different types of materials, is easy to roll around, and completely waterproof. 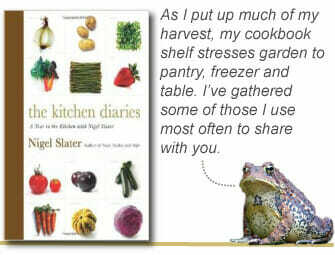 Thanks for sharing your garden faves with us! Glad the cart is a hit. My tip bag is getting a workout at the moment (except on snow days, which seem to want to reappear every so often!). My favorite hauling “tool” is an old plastic sled. It’s great for hauling stones, bags of garden soil or mulch, weeds, clumps of anything, other tools. I have my trusty wheel barrow and a tarp for leaves and branches. The best thing about my sled is that I seldom heap more on it than I can pull! I love this idea, D’Alta! Brilliant upcycling of that old sled.